Are you a graduate /post graduate and looking for the GE off campus 2018 drive? Then you are at a place where you can find a number of opportunities that will help you in developing a bright career. The main motto of GE Off Campus 2018 Drive For Freshers is to give a chance for the fresher candidate and help them in enhancing their career. Candidates can find salary details, eligibility criteria and selection process in the below given sections. There are many fresher graduates who are in search of the best career opportunities. The GE Off Campus 2018 Drive For Freshers could the best chance for all those candidates. To make their dream of working with one the best companies come true is not an easy task. The candidates should need to do a lot of hard work for qualifying various rounds that are present in the interview process. For making the interview process easy we are also providing you with the GE placement papers and also the generally asked interview questions. The candidates should be having a percentage of 65 throughout their career. The must be possessing full-time graduation degree from a recognized university. The person should not have any backlogs i.e. they should not have any exam repeated twice. The recruitment team of the General Electric is looking for the candidates with the following skills as to work with their company. The candidates having more practical knowledge are preferred. The candidates who are flexible in working with various platforms. Students having good implementation and management skills are encouraged. In the interview of General Electric, the first round of the interview is group discussion where the candidates are given a topic to discuss. After that, there will be a general written test from the basic topics of reasoning and aptitude. The technical round will be having the questions specifically from your education background. The final HR Round will be conducted in the general process. The minimum marks that are to be possessed by a candidate for attending an interview are 65 percent. The students having marks less than this percentage are strictly prohibited from applying to this company. A candidate with any backlogs during his/ her career is not allowed to attend the interview process of this company. There is no prefixed salary for any candidate who is going to work with this organization. 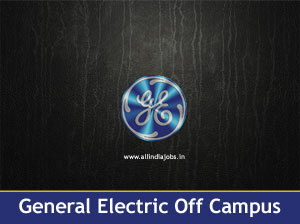 The salary would be fixed by the recruitment officers of the general electric during the time of the interview at GE Off Campus 2018 Drive For Freshers. It will generally be decided based on the skills and also by the position for which the candidate is recruited. So, the interested candidates are requested to keep these in mind before they attend an interview. The interested and eligible candidates are requested to click on the registration link that is given below. Then you will now be redirected to a page where you will be asked to provide your details and get registered yourself. By filling all your details and clicking on the submit button you are now successfully registered for the GE Off Campus 2018 Drive For Freshers. The candidates attending the drive conducted by the general electric are requested to bring all the necessary documents such as the resume, passport sized photographs, and the previous semesters mark lists and any other additional certificates that are available. To secure a job in this competitive world will be a tough task for anyone. But, to make it an easy one, we are here to provide you with some of the interviews that could be helpful for you in your interview. Firstly, maintain your sitting posture i.e. your body language also should be attentive along with your answers. Don’t give any cut short answers. Whatever you say, say it in the form of sentences. Give only the answers that are related to the questions asked. We have provided you with all the information that is needed to attend the GE Off Campus 2018 Drive For Freshers by the students. For any further details or clarifications, you can keep visiting our website www.allindiajobs.in regularly. We also give you the information of all the latest recruitment drives and various other job opportunities.